John is born miraculously to Zechariah and Elizabeth. Elizabeth is a relative of Mary the mother of Jesus, making John and Jesus relatives as well. John grows up in the desert, wears clothes of camel’s hair and a leather belt, and eats locusts and honey. 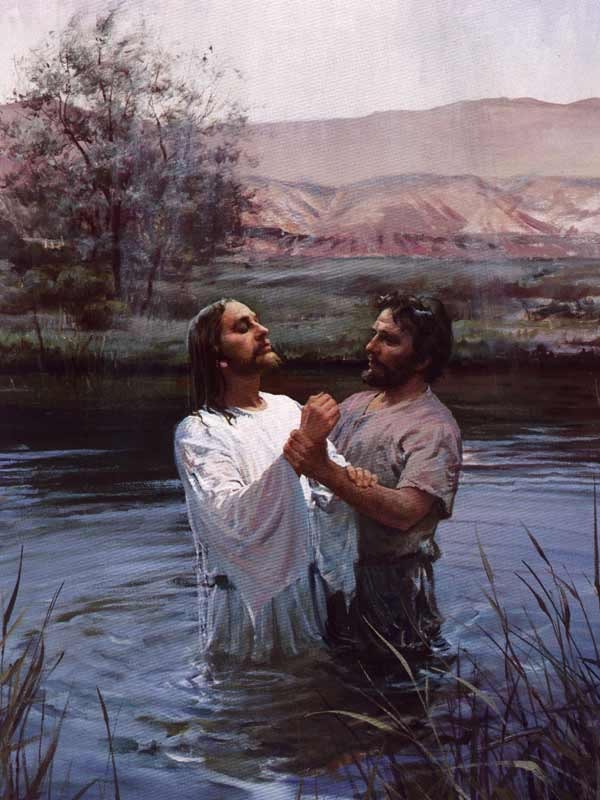 He preaches repentance and baptizes those who confess their sins in the Jordan River. After baptizing Jesus, he is put in jail by Herod and eventually beheaded at the prompting of Herod’s unlawful wife. You can read about him in Matthew 3, 14; Mark 1, 6; Luke 1, 3; and John 1, 3. John is Jesus’ forerunner; he prepares the way for Jesus’ coming. He tells the people to “produce fruit in keeping with repentance,” for “after me will come one who is more powerful than I…He will baptize you with the Holy Spirit” (Matt. 3:8, 11). He realizes Jesus is “the Lamb of God who takes away the sin of the world” when the Holy Spirit comes upon Jesus after His baptism. In fact, “the reason I came baptizing with water was that he might be revealed to Israel” (John 1:29-34). He is glad when people want to be baptized by Jesus instead of him. “He must become greater; I must become less” (John 3:30). God promised long ago to send a messenger to prepare the way for His coming. John fulfills these promises as he calls people to repentance and baptism. He says he is “the voice of one calling in the desert, ‘Make straight the way for the Lord” (John 1:23, quoting Isa. 40:3). Jesus calls him “the one about whom it is written: ‘I will send my messenger ahead of you, who will prepare your way before you'” (Matt. 11:10, quoting Mal. 3:1). Jesus goes so far as to equate John’s authority with His own (Mark 11:27-33), and people receive Him as they received John (Luke 7:29-30). Elijah is a mighty prophet who confronts the wicked kings of Israel. His feats include stopping up the rain for three and a half years, calling down fire from heaven, and being taken to heaven in a chariot of fire. You can read about him in 1 Kings 17 – 19 and 2 Kings 1 – 2. His most remarkable accomplishment is to serve as a preview of John the Baptist. God promises in Mal. 4:5, “I will send you the prophet Elijah before that great and dreadful day of the LORD comes.” The angel Gabriel tells Zechariah that John will minister “in the spirit and power of Elijah…to make ready a people prepared for the Lord” (Luke 1:17). Jesus identifies John as “the Elijah who was to come” both to the crowds and His disciples (Matt. 11:14; 17:10-13). John and Elijah even wear the same clothes (2 Kings 1:7-8)! John the Baptist is a New Testament person, but we must see him from an Old Testament perspective. He is more than a doomsday preacher who eats bugs and lives in the wild; he is God’s promised messenger who prepares the way for Jesus’ coming. He is the New Testament “Elijah” who confronts peoples’ sin and turns their hearts back to God. He happily deflects attention away from himself and toward Jesus. Let us follow in his footsteps as we prepare the way for Jesus’ second coming.